‘What do you mean sir?’ The attendant would inquire. Yes indeed and a place he got according to his ardent wish; but was this a grave befitting the elevated office of the President of the Federal Republic of Nigeria? 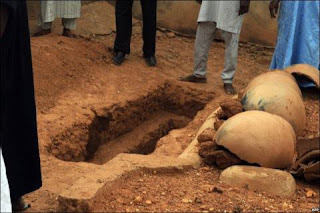 What is the difference between this Presidential Grave and that of a beggar? What is this religion that makes no distinction between leaders and followers in funeral arrangements? Here was a President wrapped in simple inexpensive shrouds and carried in an open undecorated bier; not in a closed golden casket; no sepulchre, no flowers, no wreaths, nothing! The funeral was conducted with immediate effect; the body did not lie in state or tarry in a mortuary waiting for dates to be agreed upon between Nigerian authorities and their counterparts from abroad for special arrangements to receive foreign dignitaries; no parties were organised for people to pay their respects. I wonder how many reflected on this simple yet powerful distinction, how many noted this common yet profound set of actions. Yes, that is the simplicity of, and the doctrine of equality in Islam. You can occupy any position when you are alive, but at death, and in the sight of Allah, all creatures are as equal as the teeth of a comb. The funeral procedure is the same, whether the body is that of a president, a monarch or a destitute by the road side. You can live and enjoy all the fleeting comfort that this beguiling world can offer; but at death you are only entitled to a pair of two white shrouds in a narrow grave devoid of carpeting, air conditioning or any luxury. In fact, should the closest person to you spot an opening in your grave after entombment that could allow passage of air or light, he will be the first to point at it so that it could be covered with mud. NTA and AIT television stations made it easy for most of us who were not able to travel to Katsina for the funeral of Yar’Adua to witness the event even better than those who were there. Those mourners in Katsina were stationed in one place; the crowd did not permit easy movement from one place to another; they could only view what was right in front of them. They had no knowledge whatsoever of what was going on in the inner chambers of the Yar’Aduas where the former first lady and the current one were seated; or what occurred when President Jonathan offered his condolences to the mother of the late president, and so on. But the cameras of these television stations were ubiquitous, beaming to us live the various happenings at the Yar’Aduas’ residence, showing us the arrival of almost all state governors and other dignitaries. We missed nothing but the immense reward of following the janaazah, funeral and praying over the body. For the Prophet, blessing and peace be upon him, said: ‘He who follows a Muslim’s janaazah, with imaan and seeking Allah’s recompense, from its house until the prayer is performed for it, gets a chunk (of rewards). And he who (also) follows it until its burial is completed, gets two chunks of rewards.’ Indeed, we have lost many chunks (of rewards); but may Allah grant us such rewards because of our good intentions to attend; for if we could, we would have attended. The crowd that witnessed late Yar’Adua’s funeral was highly impressive by all standards. In Islam the larger the number of people at a janaazah the better it is for the deceased. The Messenger of Allah, blessing and peace be upon him, said: ‘Whenever a group of Muslims numbering one hundred pray janaazah for a deceased, all interceding on his behalf, their intercession is granted (by Allah), and he is forgiven.’ So, how many hundreds of Muslims were at Yar’Adua’s janaazah? In another narration he said if forty righteous men pray on and for the deceased, he shall be assured of Paradise. Another thing that guarantees forgiveness to the deceased is the number of saff, rows that the Muslims made during the prayers. The Messenger, blessing and peace be upon him, said in this regard: ‘Whenever a Muslim dies, and three rows of Muslims pray janaazah for him, he is granted forgiveness.’ The entire field at that stadium where Yar’Adua’s janaazah was performed became a quasi-open mosque with endless rows of Muslims interceding Allah on his behalf to forgive Ya’Adua. Allah’s Messenger, blessing and peace be upon him, relied: “(A deceased) whom you praise will be granted Jannah. And he whom you condemn will be granted the Fire. The angels are Allah’s witnesses in the heavens; and you (the believers) are Allah’s witnesses on earth; you are Allah’s witnesses on earth; you are Allah’s witnesses on earth! Verily, Allah has angels who speak upon the tongues of the human beings, telling of any good or evil that is in a person.” So, when people were showering accolades on the person of the late President Yar’Adua, we can assert without any fear of incongruity, that Allah’s angels it were who spoke upon the tongues of human beings, telling us of the good in late Yar’Adua! “On Wednesday, 9th April, 2008, the wife of President Umaru ‘Yar’Adua, Hajiya Turai ‘Yar’Adua invited to the Presidential Villa, Abuja, all former First Ladies for a Consultative meeting. Most of them attended except a few. And now that President Yar’Adua is no more, has left the scene for others to play their part; let those who rejoice at his demise; those who thought his life procrastinated what was their birthright; those who deemed his protracted illness impeded on their ambitions; let all of these people, now, live forever if they can! O Allah! Verily, President Yar’Adua is in your custody, holding to the rope that would take him close to You. Shelter him from the trial of the grave and the punishment of the Fire. You are the One worthy of fulfilling the promises and establishing the truth, so forgive him and have mercy on him, You are the All-Forgiving, the All-Merciful. There was a mix-up during the first publication of The President’s Grave occasioned by the commencement of the article with the late president’s grave on Al-Amin Chiroma’s page (my editor) and ending the piece on my usual page on Islamic Perspective. This we later discovered confused many readers; thus they sent their responses to Al-Amin’s mobile phone number, which was not reachable throughout that week, and e-mail address. This led to the repeat of that article on 25th June, 2010 with a slightly modified, albeit original caption The Presidential Grave. Today’s feedback was to appear last week, Friday, 2nd July, 2010 but another mix-up occurred; a different article by a Muslim brother was on my page in my name. Well, what is important, to my mind, is the dissemination of authentic Allah’s message to mankind by anybody, although that piece I did not author; it was on this column due to the mix-up mentioned earlier. May Allah reward the brother handsomely. Below are some of the feedbacks that the above topic generated from readers. *My dear brother, your article on the presidential grave is fantastic. Please I need more clarifications on the photo caption, where you stated that: ‘That is not a reminder to Muslims only but I believe the Christians need it more because they are easily deceived by the allure of the trinkets, the parties, the mortuary, the parties, the golden casket, etc unlike the Muslim who goes back to base under 24 hours and naked too. Imagine if it were a Christian leader who died? May be 3-6mths of preparations, heads of states come in, blah, blah, blah…’ is it centered on Christians alone because they are easily deceived? That is not a reminder to Muslims only but I believe the Christians need it more because they are easily deceived by the allure of the trinkets, the parties, the mortuary, the parties ,the golden casket, etc unlike the Muslim who goes back to base under 24 hours and naked too. Imagine if it were a Christian leader who died? Maybe 3-6mths of preparations, heads of states come in, blah, blah, blah. Also the Muslims should stop stealing public funds and trust as that will not help them in the next world. No amount of wealth, power or lovers will agree to be buried along with you when you die. Then why the unIslamic behaviours of Muslims nowadays...? It is better to work for the hereafter than here simply as no compensation is guaranteed. So, Brother Anthony, you can see from the author of the comments on picture of the late President’s grave that he actually had both Muslims and Christians in mind when he wrote those words. I do not believe the wordings were in order as regards the statement “...they are easily deceived by the allure of the trinkets, the parties, the mortuary, the parties, the golden casket, etc...” But I believe he meant well all the same. *Salaam, Ustaz, may Allah reward you and the management of this great paper (the Leadership) for sensitizing both Muslims and Christians under this platform of Islamic Perspective. Your write up came at the right time. The time when our entire Ummah is busy pursuing the worldly things. May I also encourage you to please expatiate more on instances where people occupy positions when they are alive, but at death, and in the sight of Allah, all creatures become as equal as the teeth of a comb. Brother Jibrin, going by what we have seen in the Prophet’s traditions we can say that illness before death is a sign of repose for the deceased. No matter how trifling or severe such afflictions may be, they are laden with the glad tidings of forgiveness and elevated portions in Jannah. Pre-death illness makes a servant to turn to Allah in longing, repent and ask for pardon for his sins. One who dies suddenly may not be so lucky as to prepare for the impending, inevitable journey! *Salam, Ustaz may Allah reward you abundantly. I read your article published in leadership on the presidential grave. May I ask you this question? Is it proper In Islam to wrap a dead body with a cloth that has Qur’anic verses’ inscriptions? And as a woman, can I also join my male counterparts in the janaza service? Thank you. Jazaakallu khairan. Sister Sa’adatu, the dead should be wrapped in at least one to two (or maximum of three) white shrouds; ‘Allah’s Messenger, blessings and peace be upon him was shrouded in three white cotton Yemeni sheets... None of them was a shirt or a turban. He was simply put over (and wrapped in) them.’ As for Quranic inscriptions on any cloth, that has no sound basis in the deen. Every time we are outside Nigeria we witness janaazah prayers with men and women participating, especially in Saudi Arabia during Umrah and Hajj periods and we notice many Nigerian women abstaining from this. The above Hadeeth from A’ishah precludes accepting any opinion preventing women from taking part in janaazah prayers! Muslims have to learn ibaadah as taught by The Law Giver, not by observing what people do and imitating them. Composed of four takbeers, Janaazah prayers are offered while standing; (‘between the takbeers, one should place the palm of his right hand over the back of his left palm, wrist, and arm, and hold both hands tight against his chest). Of course it will not be fitting for Muslims to place a body in front of them and be bowing and prostrating to it. That will be shirk. From the beginning to the end of the prayers we remain standing. The first takbeer (uttered while your mind is making the intention of the janaazah, raising your hands as you do in normal prayers) is for the going into the prayer, and reciting al-Fatihah. After the second takbeer, we offer salutations to the Prophet, blessings and peace be upon, i.e. the salatul Ibraheemiyyah that we say in the sitting position in normal prayers. The last takbeer is for us to intercede with Allah on behalf of the decease to forgive and have mercy on him or her. We say assalaamu alaikum to end the janaazah prayer after the last takbeer. And that is all!